ONE Championship light heavyweight fighter Igor Subora might have been born and raised in Ukraine, but he found his second home 5,580 miles away from his birthplace. Subora was captivated with the beauty of the Philippines when he first visited the country in 2007, leading him to his decision to migrate a year after. Permanently residing in the Philippines opened a lot of opportunities for Subora, including a prizefighting career in the sport of mixed martial arts (MMA). As a fixture in the local MMA scene in the Philippines, Subora instantly became a household name. He remarkably conquered the country’s heavyweight landscape by finishing five of his first six assignments in impressive fashion. Moreover, Subora captured a local MMA promotion’s heavyweight championship belt by way of a 49-second knockout in 2011 and reigned for three years undisputedly. His success in the Philippine MMA circuit served as his footstool to be noticed by ONE Championship, which is widely regarded as the largest MMA organization in Asia. Although he is not Filipino by blood and citizenship, Subora feels a sense of pride representing the Philippines on a global MMA stage like ONE Championship. “The Philippines is my home away from home. It’s a beautiful country. I met my wife here. I also started my MMA career in this country. I am grateful for everything that this country has given me. To me, it’s an honor representing the Philippines in my international fights,” he stated. 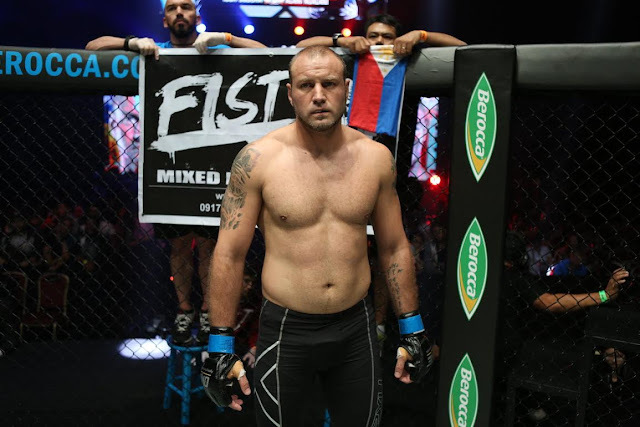 The 36-year-old Ukrainian is set to return to action on 14 January as he makes his light heavyweight debut against Egyptian combatant Sherif “The Shark” Mohamed on the undercard of ONE: QUEST FOR POWER in Jakarta, Indonesia. “I am excited to get back in the cage and showcase my newly-acquired skills. The world will see the new Igor Subora. I don’t know if my opponent is ready for what I am bringing on fight night,” Subora said of his marquee match-up against Mohamed. A Ukrainian flag might be on his back as he walks to the ONE Championship cage on fight night, but Subora makes sure to have Philippine insignia on his attire. Subora wraps a small Philippine flag around his head as his gesture of appreciation to the nation that gave him a chance to strut his wares as an MMA competitor. According to Subora, the Philippine MMA industry played a major role in his professional career and to where he is presently. “The Philippine MMA scene had an important role in my career. I am forever thankful for that. Even though I am Ukrainian, I also represent the Philippines every time I step inside the cage,” he stressed. ​For more updates on ONE Championship, please visit www.onefc.com, follow us on Twitter and Instagram @ONEChampionship, and like us on Facebook at https://www.facebook.com/ONEChampionship.